Make your images come alive with video, text, images, links and more! Examples on the Thinglink Challenge Page (scroll down to the "Get inspired! Explore Some Examples" section and use the arrows to move through the various examples. Consider using screenshots from other tools. Here's the START to a Geometry project where POPPLET was used to create the graphic organizer to show the relationships among the different kinds of quadrilaterals, a screenshot was taken (on a Mac - CMD+SHIFT+4) to get the image down to the computer then uploaded to Thinglink where links and information are offered there. THINGLINK WITH GOOGLE SLIDES? YES! 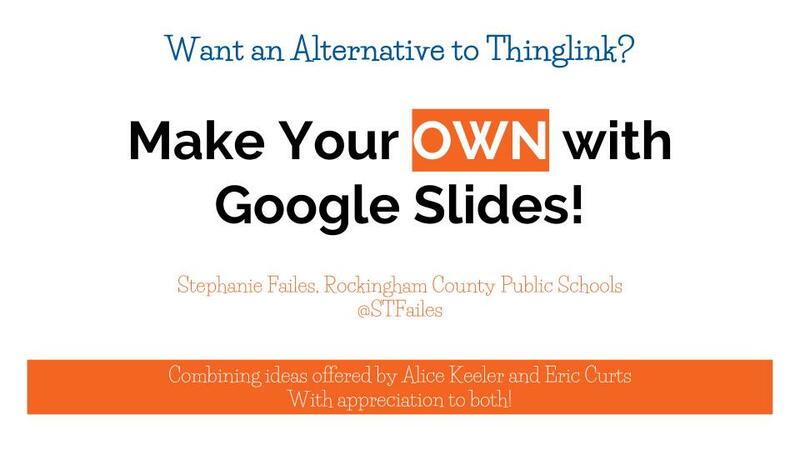 How: Google Slides as an Alternative to Thinglink -- Give it a Try!